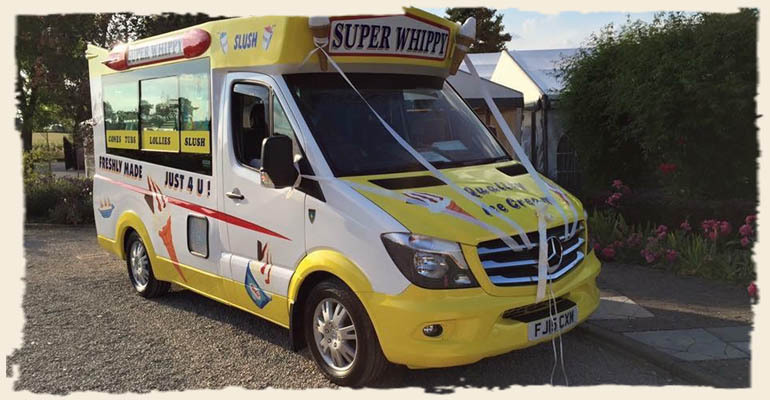 Steve&apos;s Ices operate a fleet of high quality modern Mercedes Ice Cream vans. Along with these we also have a number of Ice Cream vans dating from the 1960s & 70s. You can hire our modern or vintage ice cream vans to attend your Wedding, Party or Special Occasion. We can provide many different types of ice cream, from the traditional and most popular ‘99’ ice cream cone, to freshly made sundaes, luxury waffle cones, banana boats and knickerbockerglories to name a few. We can also supply sorbets, retro ice lollies, deserts, cold drinks and ice cold slush. Take a look at our products in our Gallery page. We can dress our vans with wedding ribbons and can create a personalised ice cream menu on the window to compliment the theme of your special day. We will amaze, delight and excite your guests. Watch their faces light up as they see the van arrive. Your guests can enjoy an ice cream while photographs are being taken or simply after the wedding meal itself. The bride and groom or birthday boy/girl have the opportunity to have a go at making their own ‘whippy’ ice cream, perfect for photos and happy memories. For private events, we work out a cost based on the number of guests, distance to the venue, time and date and your choice of ice creams to be served (usually for a one hour booking slot, longer serving periods can be happily arranged if required). Contact us with your requirements for a quote or choose from our packages. To serve up to 120 guests with our Award Winning ‘Whippy’ ice cream in a cone or tub with a chocolate flake and topping sauce if desired. To serve up to 120 guests with a wide selection of ice creams. To serve up to 60 guests with premium gelato/scoop ice cream in a choice of flavours.